I am continuing my journey with the Bridgertons’ on audio. 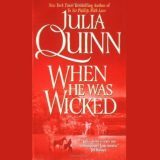 When He Was Wicked by Julia Quinn shares the story of notorious rake, Michael Stirling, and Francesca Bridgerton. Quinn made me weep, laugh and hope as these characters suffered, stumbled and discovered. 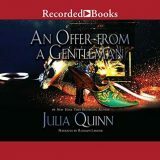 I am continuing my journey with the Bridgertons on audio, To Sir Phillip, With Love by Julia Quinn is the fifth novel in the Bridgertons series and shares Eloise’s story. Ah, Eloise, somehow I knew her romance wouldn’t be conventional and Quinn didn’t disappoint. 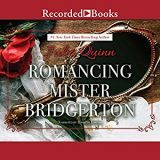 Romancing Mister Bridgerton is the fourth novel in the Bridgertons series by Julia Quinn, and I continue my journey with the narrations of Rosalyn Landor. Penelope Featherington has been in love with her best friend’s brother Colin Bridgerton since childhood, but like the rest of the ton, he barely notices her..but this season things are going to get interesting. 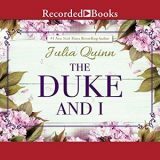 When the opportunity to review the audio of THE DUKE AND I, by Julia Quinn came along, I jumped at the chance. The first book in the Bridgertons series, this historical romance delivered with strong characters, humor, delicious banter and swoons.